Interactive Brokers LLC - authorized by US Securities and Exchange Commission and Commodity Futures Trading Commission. The company history started back in 1977 when Chairman Thomas Peterffy brought a seat on the American Stock Exchange (AMEX) and became a trading member as an individual market maker in equity options. Since then, through many years of development and integration, Interactive Brokers or IB conducts its broker or dealer business on over 120 world market destinations and is truly one of the biggest trading providers worldwide that adhere to the trading technology development. So why the Interactive Brokers gained their highest rankings and a great reputation among traders community? Firstly, the general broker’s offerings directed to the competitive, client oriented proposals through a transparent policy, low commissions, financing rates and price executions that minimize the costs, but delivers the highest level of trading technology. 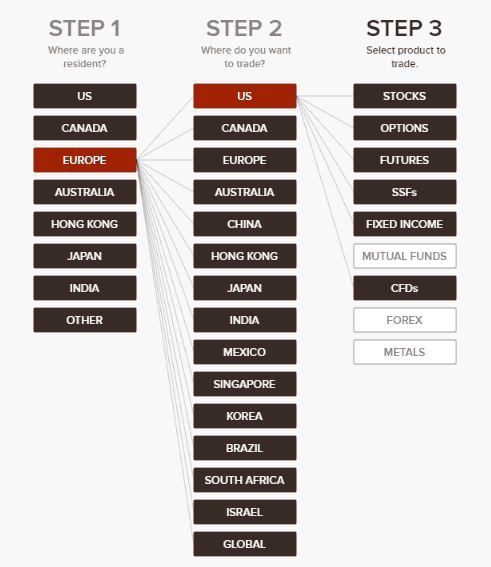 Interactive Brokers management office is headquartered in Greenwich, Connecticut and serves its additional entities in the USA, Switzerland, Canada, Hong Kong, UK, Australia, Hungary, Russia, Japan, India, China and Estonia. Its global presence delivers also multiple support to the traders’ benefit provided by a range of learning materials, insight and technology solutions for better trading, like numerous Apps, widgets or progressive software. In its broker-dealer or agency business model, IB provides direct access trade execution and clearing services to institutional and retail traders for a wide variety of products including stocks, options, futures, forex, bonds, CFDs and funds worldwide. In fact, in 2017 IBKR was among the first brokers offering client access to Bitcoin futures trading on the Cboe Futures Exchange (CFE) and the CME. Actually, apart from the retail client’s solution the broker focuses on broad offering to connect and conduct trading business solutions through Investors’ Marketplace, an online service that comprises service providers, advisors, hedge funds, research analysts, business developers and administrators. As well as introduces a new Order Management System (OMS) for Institutional clients. Overall, throughout the long operation of the Interactive Brokers Group, its affiliates execute over 800,000 trades per day. While serves as a trusted partner with numerous clients, or global companies the broker been recognized not only as an important player in the trading industry but been recognized timely by various awards and programs. Is Interactive Brokers safe or a scam? In fact, Interactive Brokers is highly and very heavily regulated by the international regulatory bodies around the world, due to its global presence and adhere to deliver truly safe trading environment. 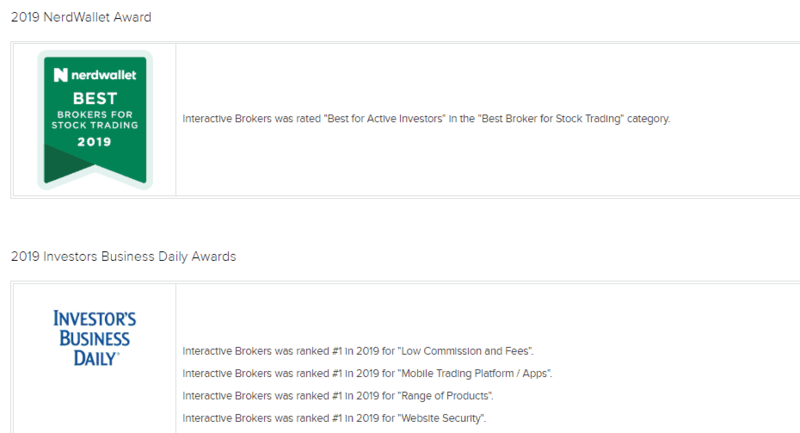 The Interactive brokers group of companies serves not only numerous entities around the word, but design and operate vast of trademarks that are all regulated and are part of the Interactive Brokers LLC: Interactive Brokers ®, IBSM, InteractiveBrokers.com ®, IB Universal Account ®, Interactive Analytics ®, IB Options AnalyticsSM, IB SmartRoutingSM, PortfolioAnalyst ®, IB Trader WorkstationSM and One World, One AccountSMare. The IB holds several operation licenses from the respected authorities that keep broker to operate in full compliance with SEC, FINRA, NYSE, FCA, ASIC, IIROC and other regulatory agency standards or the set of rules that protect traders and presence in the trading industry itself. A member NYSE – FINRA – SIPC and regulated by the US Securities and Exchange Commission and the Commodity Futures Trading Commission. Is a member of the Investment Industry Regulatory Organization of Canada (IIROC) and Member – Canadian Investor Protection Fund. ABN 98 166 929 568 is licensed and regulated by the Australian Securities and Investments Commission (AFSL: 245574) and is a participant of ASX, ASX 24 and Chi-X Australia. Is authorized and regulated by the Financial Conduct Authority entry number 208159. Is a member of NSE, BSE. Regn. No. SEBI Registration No. INZ000217730; NSDL: IN-DP-NSDL-301-2008. CIN-U67120MH2007FTC170004. Financial instruments broker: Kanto Finance Bureau Director (Kimyo) No. 187. Membership Association: Japan Securities Dealers Association General Financial Futures Trading Association. Is regulated by the Hong Kong Securities and Futures Commission, and is a member of the SEHK and the HKFE. Actually, the compliance to regulation means that every step of the operation, client’s fund management, participation into the compensation scheme, negative balance protection, procedure execution or general trading delivery has no questions, as they are taken strictly on how it has to be for the best possible performance. So you can trade with the courage and peace of mind that your funds are safe and well protected. Notwithstanding the long company history that built a reputation of the reputed and trusted financial service provider brings a stable base to trade. The range of IB Platforms comes with various software which is applicable to any of your devices and ranging according to own preferences. Overall, the technology solution of Interactive Brokers definitely on the highest level features great powerful capabilities and flexibility at the same time. Apart from the choice of the platform, each of them supports various trading products with advanced analysis tools and more additions exclusively available only at Interactive Brokers. * Desktop TWS, the platform which won a huge number of awards. Flagship platform for active traders of high volume and multiple product trades. 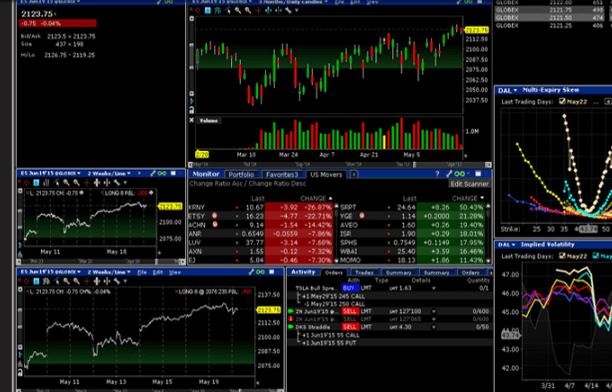 TWS features power and flexibility at the same time, with most advanced algos and trading tools. Enhancement provided by real-time comprehensive news, researchers and market data. As well as real-time monitoring at any time and risk management tools. In addition, the software always on development, hence you can load different versions even the one under the tests. * IB Mobile brings easy trading under any conditions on your mobile Android or iOS. The platform might be close to the desktop one, since including a range of advanced quotes and researchers, as well full ability to manage the account. The high security of trading provided in several ways, also the platform offers a pre-authorization that informs the company about a purchase of 1.000$ or more. * IBot is a chat/voice based trading interface for traders on the go that understands native languages and available on TWS Desktop and Mobile. *IB WebTrader is a web-based trading interface with similar functionality as the desktop version. Over 120 worldwide markets available from a single account and with the great performance with no matter of the connectivity. *IB APIs features easy-to-use tool for those who want to write their own trading software or automated trading programs. An application can be built either through IB API programming languages or as a choice by FIX CTCI. *QuickTrade brings access to the IB account with a simplified trading interface, where you can quickly place orders for a variety of asset types from within Account Management and works the same way as the Order Management Panel in WebTrader. Even though IB has a huge selection of the account types, which vary according to the client’s own preference and type, yet the account is not just a simple account, as it includes integrated investment management that allows borrowing, earn, spend and invest funds worldwide. The range of account designed specifically to meet each one’s need, while every specification is taken into consideration for both parties good and includes Individual, Joint, Trust, IRA and UGMA/UTMA Accounts. It may seem complicated to find the suitable one, but generally, you first see what is the type of your personal status, as well as diverse according to your country of residence and then tailor particular trading needs to the IB offer. Let us have a look closer what the personal group means, while the first group is the Trader & Investor Accounts, which is suitable for individual investors or traders, family office, small business or friends and family advisor. The second group is the Institutional Accounts, which are designed for registered investment advisors, hedge or mutual funds, money managers, proprietary trading group, introducing broker, incentive plan admin, SIPP administrator. And the third group developed for Other Services Accounts – compliance officers, administrators, educators, referrers. The brokers’ model on trading fee is to charge the commission per trade which is ranging on a product you trade, hence the prices are quite competitive since does not include spreads and allows you easy calculation. As a result, you will get a tight spread, as a result of substantial liquidity and the charge on commission which you have to pay on every opened position. Moreover, the commission is based on trading volumes, as well on the size of an order. The active traders’ program allows to get discount according to the account type and trading volumes trader performs, thus will result in a better price model. Generally speaking, Interactive Brokers pricing indeed is among the most competitive ones, even though the commissions or various additional fees system seem to be quite complicated with its possible fees in changing positions or so. The general outcome is still pleasant especially while trading Stocks, Futures or EFPs. The pricing on them are either Fixed or Tiered commission with a choice remained to you, either to stick to the fixed price with all regulatory fees or low broker commission depending on traded volume through tiered rates as a rebate. For instance, check out and compare fees with another popular broker Plus500. In addition, Interactive Brokers calculates an internal funding rate based on a combination of internationally recognized benchmarks on overnight deposits and real time market rates as traded, measured. So then the IBKR’s interest model will start with the fixing rates and incorporates the dynamic market pricing to produce a midpoint or “Benchmark”. IBKR accrues interest charge on margin loans on a daily basis and posts actual interest monthly on the third business day of the following month. 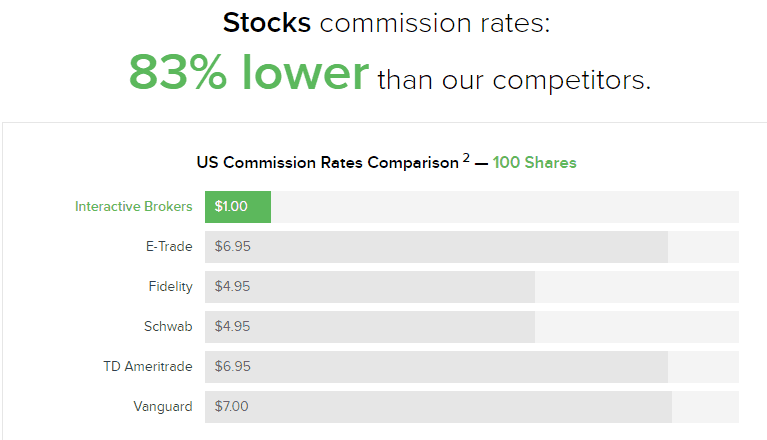 The Interactive Brokers margin rates generally apply to all customers, while in various jurisdictions, local regulators require different or higher margin rates. If the local margin rates are higher than the IB margin rates, then the margin rates required by local regulators will apply. In addition, leverage depending on the trading instrument, the country of your residence. For this reason for your easier understanding, IB provides an online tool to check on all applicable margins at your glance. Generally speaking, the leverage may vary according to the region from 1:5 on Cryptocurrency CFDs and up to a maximum of 1:400 available on Forex but for those clients that falls under Australian ASIC regulation. The payment methods accepted by broker covering the most common options, however you should check what is applicable according to your particular residence, as the methods may vary. Yet, the major options are available, so you can perform deposits or withdraw funds through bank wire transfers, ACH Initiated, US Automated Clearing House (ACH) transfer Initiated, by Check or online bill payment, BPAY, Canadian Bill, EFT, Direct Rollover (IRA only) and more. As well, IB allows transfer of funds between the internal accounts. In addition, to make the funding process easier, IB introduced the Interactive Brokers Debit Mastercard, which allows cardholders to spend and borrow directly against their Interactive Brokers account. The minimum deposit requirement varies by the account type respectively. Thus the individual account requires a 2,000$ deposit, however the Friends and Family Advisor only 200$. As well the requirement may vary according to the region, e.g. Indian residents submitted to 500$ deposit to start. The withdrawal of funds performed via a withdrawal request on the Fund Transfers page which you should complete in Account Management. The pleasant thing is that IB allows one free withdrawal every month with no need to pay a withdrawal fee. Further on, if you wish to withdraw fund again within a current month, IB will charge fees for any subsequent withdrawal. Regulated globally in numerous financial centers Interactive Brokers is known for its competitive commission rates, a very advanced range of markets and technology to trade, also its nonstop development and availability of the newest products alike Bitcoin trade through the CFD. Today, while the broker started its operation in U.S. only, brings its services further and covers mostly all world destinations and holding leading positions for their representatives and trading solutions. What we should strongly admit is the IB great offering of the broker is their technical development. Variety of platforms and tools are covering most demanding needs while bringing both performance and ease of use. The comprehensive proposals to the traders of every type, including various level traders or diverse institutions that bring the best possible technologies to the potential benefit of both parties. Overall, the broker is a well-tailored provider for the investor of any type, who may find the solution to his own demand, however the advanced level and quite high deposit capital may suit the seasoned or professional traders’ better.